At the beginning of your VO career, it can be hard to swallow the fact that you may have to shell out considerable money for studio equipment, before you even know if you'll be profitable as a voice-over talent. Many talent have the misconception that they need super high end gear to have a chance of being competitive in the VO industry, and that's simply not the case. In this post, we'll take a look at a very low budget recording setup, that costs less than $300 ($277 to be exact), and the results we can achieve with it, as well as highlight the most important factors that determine the quality of the audio you produce from your studio. If you enjoy this case study and find it useful, there are additional tips on how you can expand upon it and take your studio the next level in the resource package, which can be downloaded at the bottom of the post. Yes, your audio quality is extremely important to your success, but that doesn't mean you need to break the bank to achieve competitive audio from your home studio - and that's the keyword, competitive. When starting out, your concern should be the ability to produce audio that allows you to be competitive with other talent - a quality of audio that does not detract from your chances of landing a gig. As you progress in your career, you can then begin to expand your studio and gear and produce even greater quality audio that can supplement your read and other attributes in helping you land a job. In this post, we'll explore the Equipment, Environment, Setup, Processing, and Result of a low cost setup and how we can achieve competitive audio with it. The AT2020 is a Cardioid Condenser Microphone from Audio Technica. 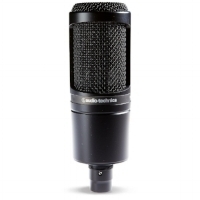 It's a highly reviewed, widely used beginner mic in home studios, known for providing a lot of "bang for your buck". The AT2020 is a versatile mic that works well on instruments, and of course - the voice. 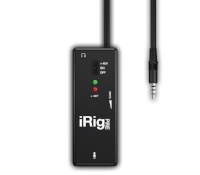 The iRig PRE is a simple 1-channel mic pre-amp and recording interface for Apple and Android mobile devices. It allows you to connect a professional microphone to these devices and provides +48v Phantom Power which is essential for powering a condenser microphone. 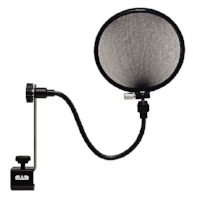 A Pop Filter helps reduce the presence of plosives in your audio recordings. Plosives are bursts of air that commonly occur on "P" and "B" sounds and can create audible "booms" in your recording. The CAD filter is a good quality model with an adjustable neck that stays in place and a 6 inch diameter. Audacity is a great beginner piece of audio recording software, with an even better price - Free! It's what we'll use to finish processing the audio on our computer. In terms of recording the audio on our tablet/phone, there are many free apps that allow you to do so as well. Having an acoustically treated space to record in is crucial to producing high quality audio. Acoustic Foam and Bass Traps from NextAcoustics offer a high quality affordable alternative to pricier acoustic absorption solutions. They have different packages and options available, but roughly $100 worth is a good start. You'll also need a Mic Stand and XLR Cable to round out your setup. In this case study, we'll use a Musician's Gear Tripod stand like the one pictured, which will run you about $25, and low cost XLR Cables can be found for between $5-10. In this example, we'll also be recording onto a tablet, and then transferring the audio to a PC where we will use Audacity to finish our production. We also use some pillows and an old Bed Comforter to help our acoustic absorption. We'll assume you have a phone/tablet to record onto, a computer to run Audacity, and some old bed/couch items laying around that you can use to supplement the Acoustic Foam Panels and Bass Traps. So now we've got all of our gear that we will need to record our VO, so let's move on to arguably the most important factor in the quality of our audio - our recording environment. For our recording environment, we're using a very small, alcove-like dressing room space - really just enough room for one person to stand in. We've treated the walls and ceiling with our acoustic panels, bass traps, and throw pillows, we've placed carpet panels on the floor, and we have hung up an old bed comforter behind us to close in the space. For VO, you really want your space to be as acoustically "dead" as possible, which means you want to minimize reflections, reverberation, echo, etc...the maximum amount that you can. Pictured is the view looking into the space to give you an idea of the finished setup. Behind the camera (not pictured) would be the bed comforter hanging up. So we've got all of our gear, and we've got a nice place to record in. Now it's time to look at how we will actually setup and use our gear in our recording space, to provide the best results. The first important consideration is Mic Position. We'll need to properly setup our mic to give us the best sound, and minimize things like mouth noise and any environmental ambiance. There is no one correct way to do this, but there are a lot of popular and regularly used mic positions. A popular one that we will use in this case study, is to place the mic 6-8 inches away from your mouth, then move it a few inches off axis either to the right or left and angle it back towards your mouth. This way, the air coming from your mouth isn't hitting the microphone directly, but the microphone is still facing the source of the sound. Your pop filter should be placed straight in front of your mouth, in the line of the air that comes out so it can catch any plosives. Another idea you can try is to setup your mic so that it is in a corner and facing out, so that you are speaking into a corner, rather than into a flat surface. This can also help minimize reflections. While it's important to treat all of the surfaces in your recording space with absorptive material, arguably the most important is the surface behind you as you speak. This is because while your microphone is facing you, it is also facing the surface behind you and is prone to catching any reflections that come off of it. This is why we hang a big heavy bed comforter behind us. We'll also need to take into consideration the input gain on our recording interface. If it is too low, it will not pick up a strong enough signal from our voice, and we would need to rely heavily on post-production to get our audio up to an acceptable volume, and doing so would likely bring about other complications. If it is too high, it will likely capture more room noise and ambiance than we would like, and could possibly clip or distort if we recite a portion of our VO particularly loudly. So for our example, we will start with our input gain rolled all the way down, and slowly bring it up until the recorded audio is at a good audible level. This is a sort of quick and dirty way to do this, but will serve our purpose for this case study. The IRig PRE we are using simply has a rolling wheel without any numbers to signify how high our gain is turned up, so I have no concrete numbers to give you, other than that the wheel was turned up maybe 25% or so. Setting input levels will be different depending on your interface and is something you should put time and care into doing. So now we have acquired our gear, designed our recording space, and set up all of our equipment properly. Here is the raw audio that results from this setup, which we will enhance further through processing in our next section. Our next step is to take this audio into Audacity, and enhance it through some further processing. I don't use Audacity very often, as I'm a Pro Tools user, but for the purpose of this case study I wanted to do a quick processing chain in Audacity with the included stock effects options, to improve our audio somewhat. With some more time you can probably get even better results and find the effects and settings that work best with your studio. The next step was to use EQ to remove some of the very low end and very high end frequency information which we do not need. Here's a snapshot of the settings I used, as well as the resulting audio at this point in our chain. Next we will use some light compression to even out the audio. Here are the settings and resulting audio. Now we will do another pass of EQ to add a little more low end since the original audio felt a bit "thin" sounding to me. Finally, we will use the gain slider to add just 1 db of gain to our final audio. There are a few ways to increase the volume of a finished file including normalization, limiting, and gain. I wasn't impressed with the results I was getting from the "leveler" and "normalize" features of audacity so I stuck with some basic minimal gain adjustment. A limiter is what I would typically use in Pro Tools. Our final result is by no means a top quality recording, but you shouldn't expect one on a very low budget setup. That's why you want your studio to grow and expand with you as your career progresses. This case study is simply and illustration of what you can achieve with a low-cost setup, and how you might go about acquiring, setting up, and using one. With some more time, experimentation and research, you can probably even achieve better results with this setup than I have in this case study. To further illustrate the need to grow and expand your studio, here's a sample of the same script, recorded on my professional setup. t's obviously a noticeable improvement, as it should be since it was recorded with better gear, in a better environment, with better processing. To sum up, when you are starting out, your focus should be on producing competitive audio quality from your home studio. Perfect, top notch quality is a goal for the future as your business grows. Ideally you would start with a setup a little better than this one, but the point is that you don't need to spend much to start producing audio that can win you some auditions. The MP3s of the audio examples in the post, that you can import into your software for direct comparison to your own audio. Voice-Over Home Studio Expansion: A guide to improving your setup as your career grows - This reference guide includes ideas for the next steps to take when expanding your home studio from a very basic low cost one, such as the one presented. If you have a low-cost setup that has been working for you, or would like to share a story of your very first home studio setup, I'd love to hear about it. Let me know in the comments!